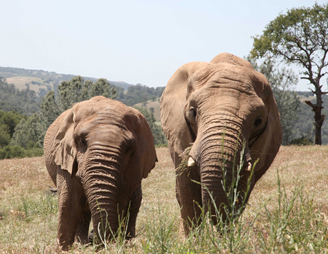 PAWS' sanctuaries are home to rescued, abused, abandoned or retired captive wild animals. At PAWS' sanctuaries rescued animals live in peaceful, natural habitats — free from fear, chains, and harsh confinement. 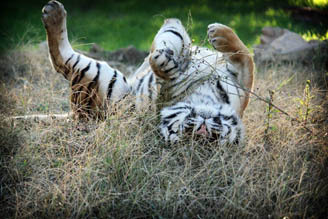 They are at complete liberty to act out natural behaviors in the comfort of their individually designed enclosures. PAWS animals are not bred, traded, sold, rented or forced to perform in any way. If you would like to help one of our animals, consider becoming an “adoptive parent,” or giving a PAWS adoption as a gift to an animal lover in your life. PAWS' adoptions are symbolic adoptions only. No animal will be sent! A PAWS Animal Adoption* Makes A Great Gift! A PAWS animal adoption makes a memorable and unique gift for animal lovers of all ages! Ever wondered what to buy the person who "has everything?" Each gift adoption recipient will receive a special acknowledgement of your gift, and you can call us to renew your gift every year. Adopt online. Select an animal category under our “Meet the Animals” links at the top of this column and choose the animal you wish to adopt. Click the "adopt" button. This will take you to the donation site where you can use your credit card or PayPal account. Include special instructions, if any, where you see the "message to PAWS" pencil icon. Complete the transaction. If this adoption is a gift, select an animal category under our “Meet the Animals” links at the top of this column, and choose the animal you wish to adopt. Click the "adopt" button. This will take you to the donation site where you can use your credit card or PayPal account. When you see the pencil icon/“message to PAWS” during your transaction, click it and type in the name, mailing address and email of the adoption recipient. Indicate if this is for a special event or holiday and include your special message to the recipient. Then complete the transaction. PAWS Adoptions, P. O. Box 849, Galt, CA 95632. Adopt by phone. Call our office at (209) 745-2606 between the hours of 9 a.m. and 4 p.m., Monday through Friday. We accept VISA, Mastercard, Discover and American Express. Have your credit card handy, and tell us which animal you would like to adopt. Select an animal category under our “Meet the Animals” links at the top of this column, and choose a specific animal. Please allow 7 to 10 days for receipt of adoption packet. *This is a symbolic adoption only. The actual animal will not be sent! All rights reserved. Copyright for photos belongs solely to the Performing Animal Welfare Society (PAWS).